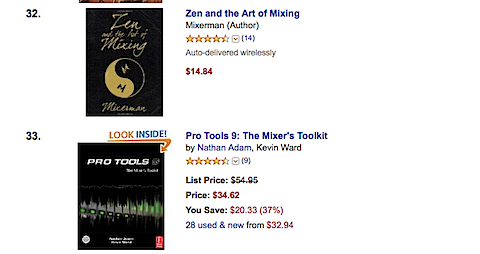 I just noticed that the book that I wrote with Nathan Adam is the 33rd most popular book in the Sound Recording section at Amazon right now. We are right behind Zen and the art of Mixing… which is GREAT company to be in. Thank you to all of the MixCoach fans who have already purchased it. Nathan and I thank you! If you haven’t bought it yet, you can get it here.